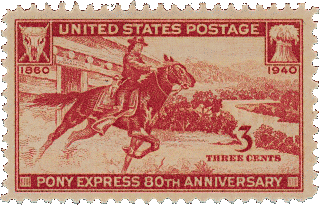 He rolled over to her a small table, and from aplastic folder lifted with tweezers, delicately, a U. S. commenmorative stamp, the Pony Express issue of 1940, 3¢ henna brown. Cancelled. »Look«, he said, switching on a small, intense lamp, handing her an oblong magnifying glass. »It’s the wrong side«, she said, as he swabbed the stamp gently with benzine and blaced it on a black tray. Oedipa peered. There it was again, her WASTE symbol, showing up black, a little right of center. »What is this?«, wondering how much time had gone by. »I’m not sure«, Cohen said. »That’s why I’ve referred it, and the others, to the Committee. Some friends have been around to see them too, but they’re all being cautious. 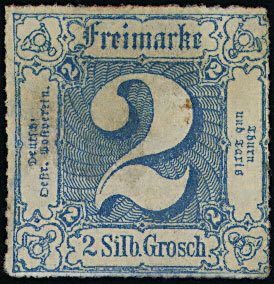 But see what you think of this.« From the same plastic folder he now tweezed what looked like an old German stamp, with the figures 1/4 in the centre, the word Freimarke at the top, and along the right-hand margin the legend Thurn und Taxis. She nodded. The black costumes, the silence, the secrecy. Whoever they were their aim was to mute the Thurn and Taxis post horn.